Jill Eileen Smith is the author of several articles, poems, and stories, and her unpublished novels have placed in five writing contests in the past five years. A children’s story, which she wrote for her church led her youngest son to faith in Christ several years ago; much like a gospel tract led her to the Lord at a similar age. That story, “Seeking Treasureland,” is now available. 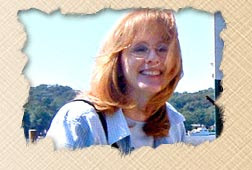 Jill is a member of several online writing groups and helps promote fellow authors’ works through monthly interviews on the "Spotlight" page of her website. She, along with her husband and children, are active members in their local church. A stay-at-home mom, she homeschooled the couple’s three sons for twelve years through high school, seeing them go on to higher education. In her spare time, Jill teaches piano, reads, does picture scrap-booking, and enjoys trying out new recipes, especially those that include dark chocolate. Jill and her family make their home in Southeastern Lower Michigan. Can their epic search for true love survive a father's fury? 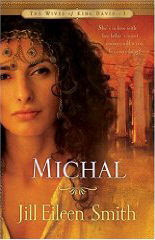 The daughter of King Saul, Michal lives a life of privilege--but one that is haunted by her father's unpredictable moods and competition from her beautiful older sister. As a girl, Michal quickly falls for the handsome young harpist David. But soon after their romance begins, David must flee for his life, leaving Michal at her father's mercy in the prison that is King Saul's palace. Will Michal ever be reunited with David? Or is she doomed to remain separated from him forever? Against the backdrop of opulent palace life, raging war, and daring desert escapes, Jill Eileen Smith takes you on an emotional journey as Michal deals with love, loss, and personal transformation as the first wife of King David. Jill Eileen Smith has more than twenty years of writing experience, and her writing has gathered acclaim in several contests. Her research into the lives of David's wives has taken her from the Bible to Israel, and she particularly enjoys learning how women lived in Old Testament times. Here's the second book for this week, another fictionalized account of a Bible character. It looks really interesting, but again I miscalculated being on vacation and have not yet read it!